Mazda kills the RX-8, CEOs fly the friendly skies and it's Camry time! 1st Gear: Mazda stops building RX-8s, whither the rotary? Mazda has stopped production of the RX-8 sports car, citing falling sales worldwide, and now the company that built its image around the rotary engine has no vehicles driven by it. Mazda has said it was only "pausing" production of rotary engines while it focuses on its SkyActiv engine tech for traditional piston-powered cars — but given the massive head start those engines have on tougher fuel economy and emissions standards versus Mr. Wankel's traditionally thirsty invention, this looks like the end of the road. Monday's big deal between Ford and Toyota to jointly develop hybrid full-size pickups and new telematics systems apparently began when Ford CEO Alan Mulally bumped into Toyota CEO Akio Toyoda in an unnamed airport and brought up the idea of working together. Of course Toyoda would be willing to listen to Mulally; when he was hired as Ford's CEO, Mulally called his Lexus LS430 "the finest car in the world." 3rd Gear: The new Camrys are here! The new Camrys are here! And while Akio Toyoda makes nice with Ford in public, his legions plan to launch their latest plot to dominate the American market in the guise of the 2012 Toyota Camry. While sales of the Camry are down 8% this year, it's still America's favorite mid-size sedan, competing with Gap and Dockers for the title of largest beige producer. 4th Gear: Austin F1 circuit just taking a siesta, no worries, really. After several calls from workers saying construction had stopped on the Formula 1 track in Austin, the Austin American-Statesman dug up a reply from the track's builders, who said work had been paused briefly due to variations in the build schedule, as some parts of the track still set to open next June had been running ahead of schedule. While the track's promoters say June is still the date, all signs from Bernie Ecclestone's crew point toward a November race. At this weekend's Pebble Beach Concours d'Elegance, Jay Leno joked about a Saab 9-3 Aero convertible that was being raffled off: "I don't want to be mean, but this will be a collectors' item." This morning's Saab story: More trouble possibly paying workers ahead of a planned restart of the Trollhaten factory on Aug. 29. Or as we know it, Tuesday. 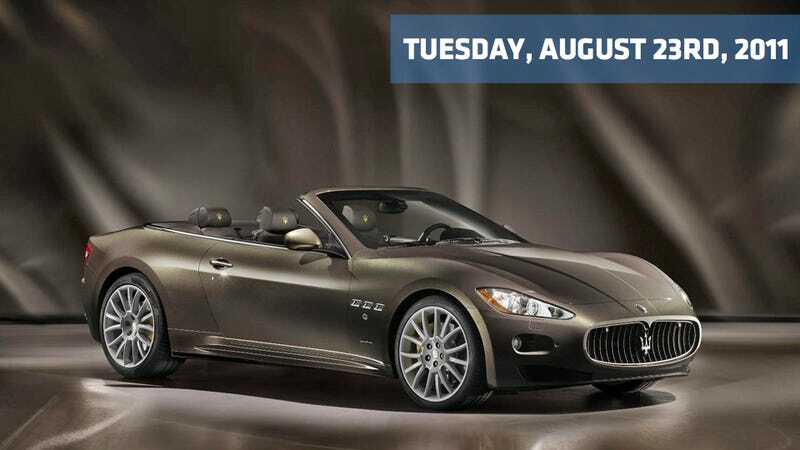 The Maserati GranCabrio Fendi, another coming attraction for the Frankfurt Motor Show next month, is basically a high-fashion version of the trident's four-seat convertible, with Fendi logos, bespoke leather interior and an intricate paint color that Maserati calls "Grigio Fiamma Fendi" and I call "close enough to brown." On this day in 1904, Harold D. Weed of Canastota, New York, is issued U.S. Patent No. 768,495 for his "Grip-Tread for Pneumatic Tires," a non-skid tire chain to be used on automobiles in order to increase traction on roads slick with mud, snow or ice.